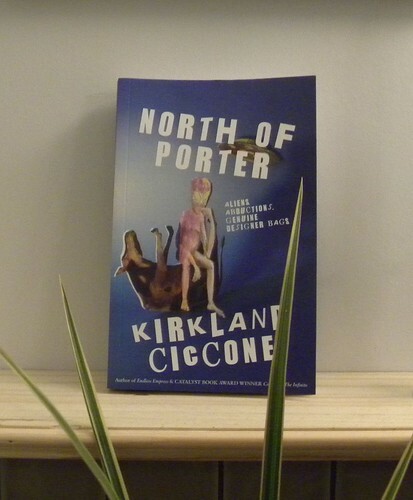 I liked Kirkland Ciccone’s third novel, North of Porter, a bit more than I think he’s expecting. I reckon he’s found himself as a writer now. Don’t misunderstand me, North of Porter is still a crazy book, but it’s much more of the right kind of crazy. In fact, I suspect Porter is Kirkland. Or should that be the other way round? We’re back in Cumbernauld, or Castlecrankie as he calls it in order to throw people off the scent. Porter is a sad specimen of a teenager at times. And at times he’s really quite with it. He’d be better still if he didn’t obsess so much about his Dolce and Gabbana handbag. His parents are crazy, and quite corrupt. There are aliens, one of whom is called JFK. Teenagers are going missing from Castlecrankie, and the workers at the pie factory are on strike. You have the usual crop circles. And then there is the poor cow that turns up in Porter’s flat, on the 16th floor. Also, his older brother is dead and his parents keep the body in a suitcase in the wardrobe. So there you have it. It’s the kind of list of craziness you end up with if you sit down to make a list. And then you try and write your novel as though you are a bit crazy too. You know, sentences like ‘he wasn’t gone long before something murdered him noisily.’ It’s bad, but by then you have come to expect this kind of thing. It might be a government conspiracy, for all I know. In all this craziness, the only thing I don’t believe in is the en-suite in Porter’s bedroom. I mean, this is Cumbernauld, for goodness’ sake. A high rise. A speaking lift that is obviously also crazy, seems quite normal by comparison. So, yes. I didn’t actually hate it at all. It was fun visualising Kirkie and his handbag sorting the aliens out, and all that. Sorry, I meant Porter. I was old enough to potentially be able to go and see the famous exhibition in London just over forty years ago, but it was before my time of madness and travel. A friend of mine went, though. 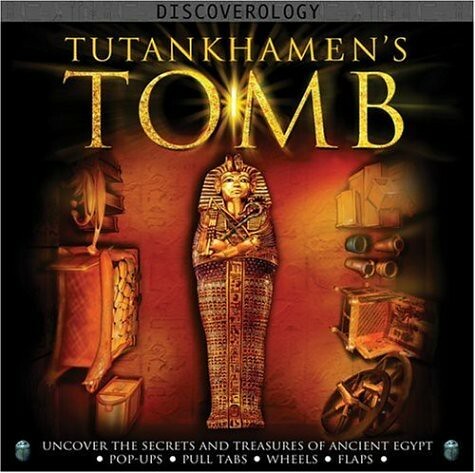 So he’s still mainly a name to me, Tutankhamun. Better known than others, but I’ve not had any images stuck in my mind, or any knowledge, come to that. Other than he was young. What I hadn’t realised was that Howard Carter, who found him in 1922, had been at it since he was quite young, too. He came to Egypt as a 17-year-old, over thirty years before he met his dead king. I didn’t notice the flamingos in Santa hats as I arrived. 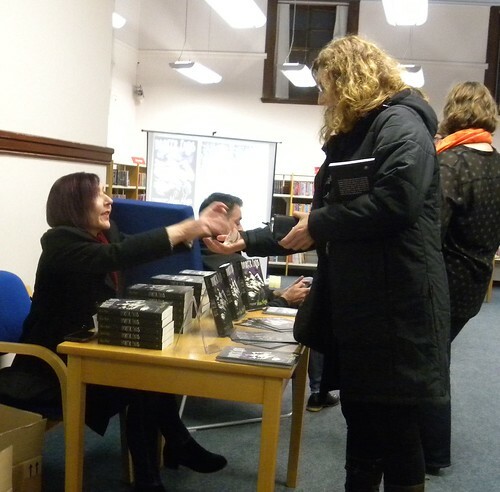 Maybe they turned up while I was inside Dunblane library on Thursday evening helping launch Alex Nye’s new book Darker Ends? There would have been room for them as well, but only just. I rarely see libraries this full, so it made for a nice change. 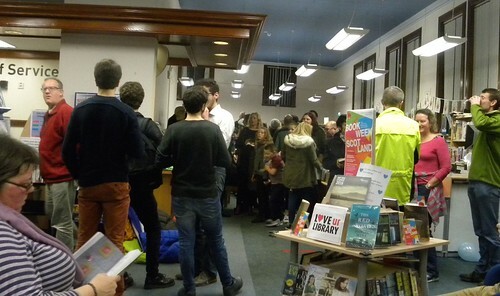 Despite it being a dark and rainy night, and despite Dunblane deciding to have its Christmas market on the very same evening, people flooded to the library. 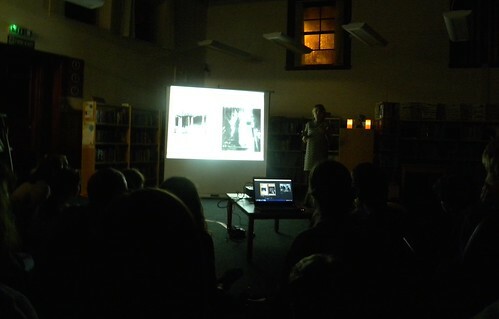 It was Alex’s third launch (for this book), after two large affairs in Edinburgh and Glasgow. 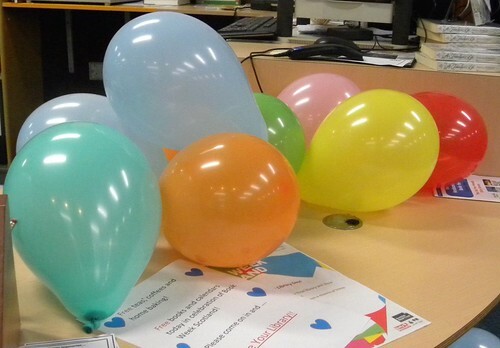 And I believe she was planning yet another for the other Dunblane library yesterday. There’s no stopping some people. 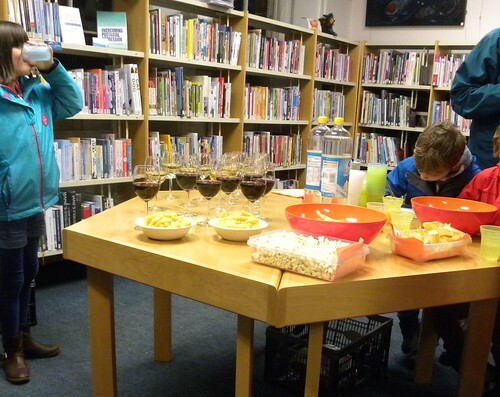 After wine and crisps and things, and a kind of library quiz for the younger ones, we were plunged into darkness. I’d ‘reserved’ a comfortable seat early on, but many sat on the floor. They were mostly the sort of age where you can sit on the floor. There were a few beanbags as well. Alex talked about the iceberg of writing. At book festivals you see only the tip of the [author] iceberg, the success and the smiles and everything. Then there is all the bad stuff, the lack of confidence and the uncertainty, the hard work. She knew from a very early age that she wanted to be a writer, and she had a supportive family. But unlike with other jobs where it’s clear what route you have to take to get there, it’s not quite as simple for the wannabe author. She won a writing competition at 16 with a story titled A Mould of Flesh, and she still has the book it was printed in. Alex came to Edinburgh, found she loved Scottish history, and wrote a novel about Mary Queen of Scots, which no one wanted. (It is about to become her fourth published book, after Darker Ends.) After some travelling, she returned to Scotland, living on Sheriffmuir, which is where she set her first two novels, Chill and Shiver. Her publisher, Clare Cain, had a table groaning under copies of the book, which sold well, and judging by the happy crowds and the fact that they were able to ‘borrow’ the town’s official fireworks and everything, I’d say it went pretty well. And the flamingos looked nice. By the time it was too late I realised that I never took a picture of Alex herself, apart from the one in the dark. So you can have these tired guys instead. 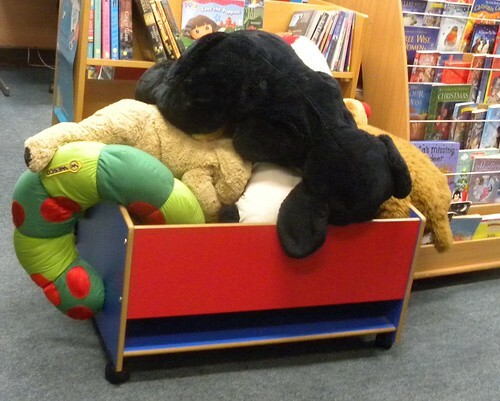 They had clearly been overwhelmed by all that reading and needed a rest. 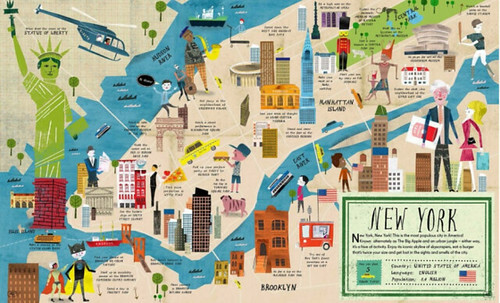 Travel the World with 30 City Maps. It’s Non-fiction November, and here is an atlas to inspire the reader to visit lots of cities all over the world. Or possibly ‘only’ read about them, which is equally fine. Written by Georgia Cherry and illustrated by Martin Haake, this atlas is a little on the large side to actually travel with. It’s more for inspiration. The double page spread for each city is not so much an actual map, as a colourful sketch of the city, showing many of its most famous landmarks and pictures of people and possible activities. And for every city, if you look closely enough, you will find a small person saying hello, in the langauge of that country. Sketch it might be, but looking at the cities I know, I feel it’s quite accurate. For Stockholm they’ve got Långholmen to the west and Gröna Lund to the east; just where they should be. It can be quite tricky finding the small person greeting you, which is presumably intentional. That way you see everything there is to see while you search. 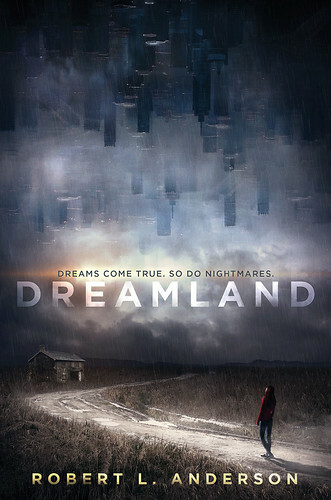 At first I thought I wouldn’t read Dreamland. It doesn’t look like my kind of book. But I did my usual and read the first few pages, and I found such a likeable ‘supporting character’ in Gollum, that I knew I had to read it. That turned out to be a good decision. The main character in Robert L Anderson’s first novel is Dea, who is 17 and lives with her mother outside a very small town in, I think, Illinois. She’s always been different and an outsider, and Gollum is her first almost friend. Gollum is even less popular at school than Dea. Dea ‘walks’ other people’s dreams, i.e. she holds something belonging to another person and that way she can enter their dreams. Her mother is the same, and both of them do it because otherwise they become weak and fall ill. There are rules. You mustn’t be seen and you can’t interfere in the dream. And never enter the dreams of the same person twice. When the gorgeous and friendly Connor moves in across the road, Dea has a friend, and a sort of boyfriend, and she decides to ignore the rules. Connor has a troubled past, and she wants to help him. This is much more fascinating than it might sound, and I was hooked from the word go. You just have to find out what will happen, and why things are as they seem to be. It is very small town America, and Robert blends complete normality with fantasy in such a way that you simply believe. As I said, you have to love Gollum, and Connor is an unusual teenage boy/romantic interest for this kind of novel, and it all feels very fresh. You find humour and friendship and courage and determination. And there could be a sequel. If one is planned I don’t know. When I first joined Facebook – and I must point out I only did it for literary reasons! – I was quickly introduced to lots more authors than those I already knew and corresponded with. It’s that automatic suggestion system thing they have, and before long I was awash in new – to me – authors of children’s books. Some of them I’d barely heard of, and I had not read anything by them. But then I discovered a new category of people. I don’t want to call them wannabes, as that sounds childish, and as though you could become a published author if you only wish for it enough. Hopefuls, maybe. Those fully intending to be out there with published books very soon. I was amazed at how they all seemed to know each other, too. I was under the impression that garrets were there for a reason, and when you weren’t even published, how could you know others who were also not published? Seems there are groups for everything under the sun. They knew each other because they attended writing groups, or critiquing groups, or any other kind of authorial group. They supported each other. They were friends. But I was always afraid that when they did get published, I ‘would have to read’ the books and that I wouldn’t like them. Well, that was almost as silly as my other ignorant thoughts, because the books have all been great. Many of the ‘hopefuls’ were published around the same time, like Keren David and Candy Gourlay and Jon Mayhew. Teri Terry wasn’t far behind. But so far Kathryn Evans hasn’t joined them. Until now. It’s almost more exciting, after such a long wait. Not everyone writes at the same speed, and of course, I never knew where in the process people might be when I first encountered them. And Kathryn has strawberries to grow, and bellydancing to do. 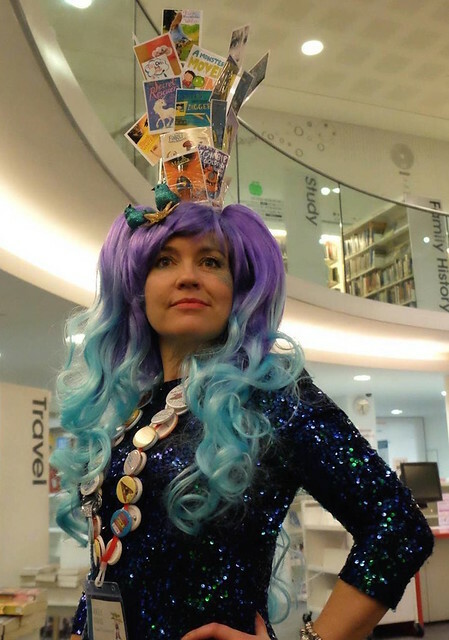 Here she is, at the recent SCBWI conference, wearing purple hair and the covers of books being published by her SCBWI friends this year. (In other words, perfectly normal…) Kathryn’s own book – More of Me – will be published in February. I’m really looking forward to it. That FBI. It gets everywhere, including the 17th century. But that explains a lot, actually. And it’s lucky they wear those fetching overalls, with the letters on the back, so you will know it’s them. And there is always one more wormhole through which any combination of characters can fall, to some time other than their own. Quantum foam. Hah. Yes. 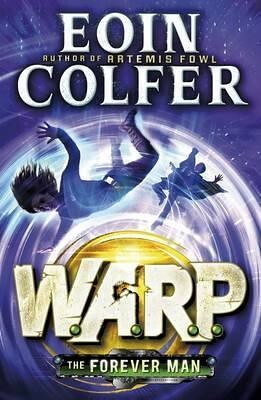 So Eoin Colfer thought it’d be more normal to write about time travelling FBI agents than leprechauns. It’s easy peasy getting your head round tunnelling dwarves and foil-clad centaurs, but my head always gets confused when it tries to think about time travel. Like, if so-and-so did this then something would/would not happen. And you mustn’t meet yourself. I enjoyed The Forever Man, which is the last instalment of Eoin’s W.A.R.P., the time travel-based witness protection scheme which put people safely in Victorian London. I wasn’t sure I would, as the time travel slipped back to Cromwell’s days – which I’m not keen on – and Riley’s old boss was going to reappear. I’d really hoped to have seen the last of him. But that strange thing happened; where you find yourself almost fond of the baddie, because you go a long way back and familiarity doesn’t always breed contempt. So – the now unkillable – Garrick is back, and his latest hobby is to burn witches at the stake. And he decides Agent Chevie is a witch. Riley needs to free her, but the trouble is that he and Garrick know each other so well, that it’s almost impossible for one to trick the other. Luckily the FBI has one or two tricks up its sleeves, and not everyone in this witch-hunting village believes that burning witches is a marvellous idea. This is exciting, and romantic – yes – and funny. It even restored my faith in the FBI. Eoin; please consult me if you need more timetravelling Swedish bores. Sorry, boars. Or similar. Especially if they are to be called Olaf.